But a gamer might not always be the best influence on a child, as we saw when we played Black and White…..Black and White was an interesting game. The player was a god who was in charge of the prosperity of his people. You could play as a benevolent or capricious deity, powering your spells through prayer or human sacrifice and with those spells you could either protect or heal (nice, but dull) or do the full ‘fire and brimstone’ thing (bad guys have all the cool spells...). 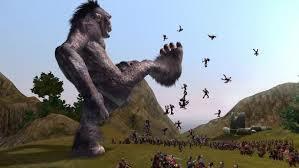 During the course of the game you obtained a creature, a normal animal transformed into a towering giant by your divine might. It becomes intelligent during the transformation but is naïve about the workings of the world. It’s your job to teach it and help it become the instrument of your will. The game used a simple system of reinforcement; when the creature did something you like, you rewarded it (with stroking or food) and when it did something wrong you could slap it or hit with a spell. It’s the same basic theory as raising pets (though pummeling your cat or throwing fireballs at your dog is generally frowned upon). Like raising pets in the real world, consistency is everything. If the same behavior gets different responses the pet gets confused. Pets can quite easily associate the wrong thing too; like the dog who got sprayed with water mist whenever it jumped on the sofa. Instead of learning the desired lesson (don’t jump on the sofa) he ran in terror whenever anyone opened a bottle of water, ran a tap or carried a glass. 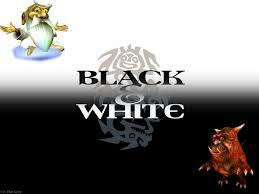 We got a chance to show off our creature’s in Black and Whites simple multi-player game. You could all join a game and bring your creature in with you. There you tried to eliminate everyone else or turn your town into the greatest city in the land. Most of the creatures were of a utilitarian bent; helpful, decent in a fight and obedient. There were two exceptions however. My creature was a beatific tiger. He went around bringing food to the villagers, healing the sick, helping them with their construction and playing with children. This was reflected in his looks; bright, light colouration and a saintly glow at all times. He didn’t have a violent bone in his body. Of course, this meant he was regularly pummeled by everyone else’s creature. He stand there, getting punched, clawed, fried and zapped; pitifully shielding his face while everyone used him as a punching bag. I’d raised a conscientious objector. It got pretty traumatic actually (which is one reason I didn’t play online) but ironically even with his total ineptitude in combat we won the game. It turns out even if you’re rubbish at fighting, if you help everyone enough they win the game themselves. Some kind of lesson there, I’m sure. The other exceptional creature was a monkey. His ‘owner’ (lets call him “Bol”) was totally random with what he wanted him to do; most of the time he just wanted the monkey to go away but sometimes Bol ‘encouraged’ particular behaviours, normally with a lightning bolt. This resulted in a creature that could only be described as totally insane. Stopping dead still and staring at some random thing for minutes at a time. Picking up poo, setting fire to it, then eating it. Setting fire to himself then pooing on villagers. Setting fire to villagers then throwing their burning bodies at village huts. Then pooing. 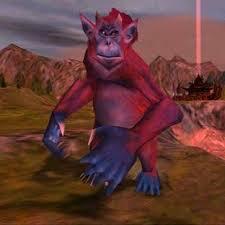 The ape looked like some hellish monstrosity. He’d morphed into the most evil-looking monkey you could get in the game and then layered a mass of scars and burns over the top. Because he basically only ever ate poo (burning) and villagers (poo-covered/burning) he was emaciated as well. Bol’s cunning plan was to leash the ape to other people’s villages and let him run amok; it didn’t matter what he did as long as the ape stayed the hell away from his masters village. Strangely, he wasn’t exactly obedient and soon after the start of the game, Bol’s village was a wasteland. It did create an interesting ‘force of nature’ mechanic where you watched the ape-beast-of-evil randomly wandering and you’d hope it wouldn’t go anywhere near your village. My tiger would often venture out to help the crazed-demon-monkey, healing him when he set himself on fire and offering him food. The monkey seemed to appreciate it. Then he’d pelt my weeping tiger with burning excrement.